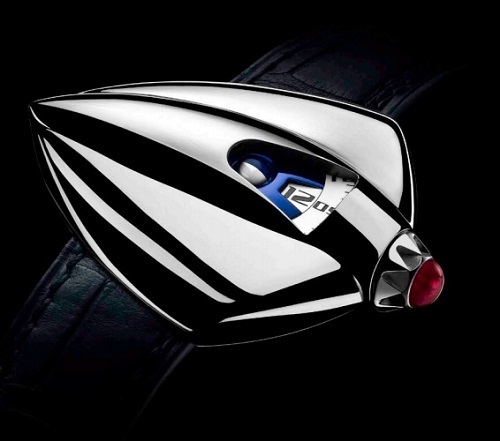 Sculpted, smooth and with a profile which begs to be caressed, this is the De Bethune Dream Watch 5. Revealed to the public at the start of SIHH week during which De Bethune are hosting their own private shindig across town in the Four Seasons Hotel des Bergues, this watch promises to upstage most if not all that the industry big-boys have to offer with its mirror polished titanium case, its jump hour/disc minutes combination, its spherical moonphase and its superb little cabochon-cut ruby adorned crown. We will follow up with a indepth feature on the De Bethune Dream Watch 5 in the coming weeks, but for now discover this watch at the De Bethune website. Le Garde Temps, Naissance d'une Montre - A Watchmaking Adventure.